Has there ever been a good Christian metal band? As reactions to the baptism of Of Mice & Men’s Austin Carlile have proved, metal and Christianity have always had an uneasy relationship. As an amplification of rock’n’roll’s radical rebellious spirit – traditionally connected with the Chief Rebel Angel, Lucifer - the outsider individualism of metal seems diametrically opposed to the organised dogma of Christianity, even to its most benign principles. Metal is a safety valve for releasing and examining the darkest aspects of existence. So if God is love, He’s not very metal. This goes some way to explaining the general perception of ‘Christian Metal’ as a risible oxymoron, but it’s a perception the scene has done little to dispel. In response to criticism from the conservative American Christian orthodoxy - exemplified by the YouTube video “Is Christian Metal Really Christian?” - Christian Metal’s defence is summed up by metalforjesus.org: “Thru Christian Metal we can talk the metalheads language and have their attention. When we have got their attention they will also be open to the great message of salvation in a way they relate and understands (sic)”. This idea of Christian Metal as an exercise in evangelical conversion, co-opting secular aesthetics to seduce unwitting youths away from a life of godless sin, is partly why it’s so widely reviled. It’s why Christian Metal seems not just one remove from the wider metal world, but its own parallel universe of diluted mediocrity. It’s why so many avowedly Christian bands are largely content to replicate the sounds and styles of much better, secular artists, replacing dark ambiguities with promotion of a lifestyle and mission that are anathema to the urges that ignite the best metal. Few resent the concept of Christian Metal more than the best Christian musicians on the receiving end of the tag. Spiritual free-thinkers King’s X often got lumped into the Christian scene; guitarist Ty Tabor identifies himself as Christian, but has no truck with it. “The three of us have always been absolutely horrified with having anything to do with the actual Christian industry,” he told Blabbermouth in 2005. Evanescence and Creed also moved to repudiate early links to the Christian circuit. Eric’s perspective highlights the inverted snobbery against Christian metal among secular headbangers, which might explain why the only subgenre that has produced multiple Christian scene leaders is equally scorned by elitists: metalcore. As I Lay Dying, The Devil Wears Prada, Underoath, August Burns Red, Norma Jean, Haste The Day, Memphis May Fire and Austin Carlile’s previous band Attack Attack! have all crossed over into metal’s mainstream in a way that only really 80s Christian Rock band Stryper attained in previous decades. Christian Metal isn’t a sound. 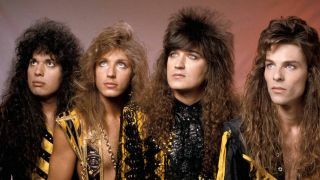 Every metallic subgenre has its Christian representatives, from the 80s glam of Stryper, Holy Soldier and Bloodgood to the audacious ‘unblack metal’ of Horde, Antestor and Crimson Moonlight. But as Trouble, Place Of Skulls and The Gates Of Slumber attest, it’s arguably doom metal where the Biblical impulse makes most sense, perhaps because of the crosses worn by Black Sabbath and the perspectives embraced in the After Forever lyrics.